Having reached THAT AGE myself has led me to reconsider my own presbyopia options. Many of my peers are also experiencing this rite of passage and my wife has started wearing progressive lenses. Here's a little ditty in case some of you need pointers regarding progressive lenses, and are finding them hard to get used to. Progressive lens spectacles are in fact a boon for many people. By combining both far and near focus points in a single lens, they allow an older (presbyopic) person to see clearly at both far and near distances, with the same pair of glasses. And besides which, nobody can see the dividing line, thereby making it much better cosmetically than the normal bifocal lenses. However, they are by no means a panacea for presbyopia. Many people try them for a while, then give up because they cannot find a way to get used to them. The thing is to know what to expect, and to obtain some tips which will allow one to overcome their deficiencies. These lenses have a central vertical zone, which changes in power from top to bottom. The top part of this zone is for distance, the middle part for intermediate vision, and the bottom part for near. At the sides there are regions which try to blend the powers together but cause a degree of distortion depending on how high the spectacle power is, especially if it is a high longsighted (hyperopic) power. It can take a while to get used to the fact that with progressive lenses, rolling your eyes in different directions (especially up and down) gives you clarity at different distances. This can be a problem for some people eg if they roll their eyes downwards to look at steps. Doing so can make the steps go blurry, since the person would be looking through the near part of the lens, which is actually for reading distance. 1. Start with progressive lenses that have a lower power reading portion. This also means that it is actually a good idea to start wearing them at an earlier stage (and age). With a lower power reading portion, the shape changes across the lens are more gradual, and less pronounced. As such, any distortions that occur in off centre directions of gaze are also going to be milder. 2. Learn to turn your head to look in different directions more. Eye rolling movements are still fine, but especially in a vertical direction, eye rolling will be used more for changing the effective power of the spectacle, with the changing of object being looked at a secondary/less important effect. 3. In conjunction with the above, many wearers learn to tilt their heads slightly in different directions to help the eyes look through the appropriate portion of the lens. For example, when looking at near objects, the chin may be tilted slightly upwards to help the eyes roll downwards. These head movements are generally minimal, especially since reading materials are usually held in a lower position. 4 .Take good care of them, because it is very critical how these glasses sit on your eyes. If they are accidentally bent because someone sat on them, there is a good chance that wearing them could cause headaches. Imagine this-the slanted glasses (higher on one side and lower on the other) will cause one eye to look through the distance portion, while the other eye looks through the near portion! 5. 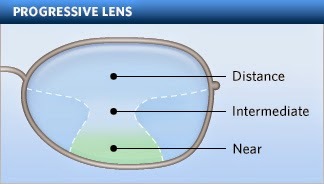 Some people who do a lot of intermediate and near work (eg, computer distance at about 1 meter and also reading at 1 foot while working at the office) may find the intermediate part of a normal progressive lens too narrow. They may consider special progressives that have a top part for intermediate distance, and a bottom part for near vision. These glasses would only be used while working at the desk, with the computers and reading material. Hi really impress you. you provide nice information. Buy purchase of Japan IMOOL online contact lenses Chocolate Brown special sale,which is on the meitongs.hk. the brown contact lenses create daily girlish style.We have the largest supplier of IMOOL contacts in Asia, which is sold to the United States, Britain, Australia and southeast Asian countries.